Oliver Daumke's lab figures out how the inner membranes of mitochondria "get their groove" and assume the complex shapes they need to carry out crucial cellular functions. About two billion years ago, foreign bacteria invaded the ancestor of a cell and took up permanent residence there. This symbiotic relationship was so beneficial to both organisms that it was preserved in all of their descendents. Today the parasites live on, in the form of cellular organelles called mitochondria. They have their own genome, can no longer survive outside, and our cells require the services they provide. Defects in their structure have been observed in cancer, a range of neurological conditions, and other diseases. Oliver Daumke's group at the Max Delbrück Center for Molecular Medicine in the Helmholtz Association (MDC) has now solved an important riddle about mitochondrial structure. In a paper in the current issue of Nature Communications, members of the lab and collaborators from Freiburg, Homburg and the Halle-Wittenberg University expose a protein's role in building intricate folds in mitochondrial membranes. The result is a labyrinth with a precise structure of twists and turns that permit the organelle to function. The membranes of mitochondria have two layers: an outer one facing the cell environment, which is smooth and shell-like, connected to an inner membrane that is folded and wrinkled. If you think of the two membranes as cloth, then the effect is like a glove sewn inside a mitten. Your hand would represent the contents of the mitochondrium, and the empty spaces between the fingers would be tube-like gaps between the two membranes that scientists call cristae. These long, inward folds bear proteins that participate in the metabolic and energy-producing activities of mitochondria. 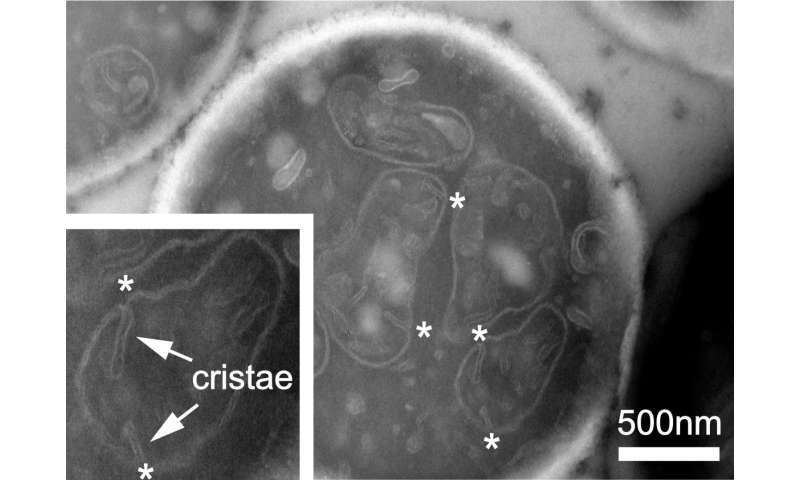 The cristae probably have additional functions when mitochondria fuse together or divide to make new copies. If their folded structure is disturbed, the mitochondria are likely to break down and release substances that are toxic to the cell. Thinking of the cristae as spaces between fingers, then the gaps between fingertips, where glove meets the "outer membrane" of the mitten, are the cristae junctions, or CJs. At these positions reside molecular machines called MICOS, consisting of at least seven proteins, and they play a crucial role in giving the membranes their proper shape. "There was evidence that two MICOS proteins, Mic10 and Mic60, are particularly important to folding and cristae formation," says lead author Manuel Hessenberger. "Removing either one causes profound changes in the architecture of the membranes and the organelle. Without Mic10 or Mic60, cristae detach and fill the mitochondria with extra stacks of membrane." Other types of deformations occur when cells produce too much Mic10 or Mic60. Oliver Daumke's group specializes in structural biology, where the aim is to understand the connection between a molecule's physical structure and its cellular behavior. 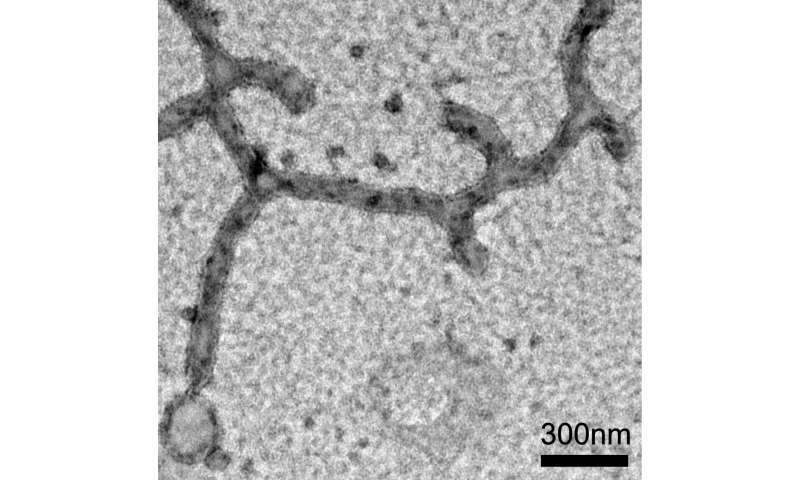 Investigations of Mic10 had shown that the protein tends to assemble into a curved scaffold that draws along the membranes they are bound to. Researchers believes this helps bend the membranes into the sharp curves that they have to form to build cristae. But the functions of Mic60 have not been clear. Manuel Hessenberger carried out experiments in the test tube in which he added the protein to the lipid building blocks that make up membranes. This caused the lipids to form long tubule-like shapes similar to cristae. "By directly binding and remodeling membranes," Manuel Hessenberger says, "Mic60 plays a central role in the formation of the cristae junctions and shaping the cristae." The scientists discovered the exact site in Mic60 that binds to membranes. When Mic60 isn't integrated into the MICOS complex, it is folded in a way that shields this membrane binding site and prevents it from binding. This changes when another component of the MICOS complex, called Mic19, binds to Mi60. "This combination anchors protein complexes to the contact points between the cristae and the outer mitochondrial membrane," Daumke explains. "Once they are there, they can reshape the inner membrane, allowing it to make the sharp bends in the cristae, and they hold the whole thing together." Mic60 inserts itself into membranes in a way that stabilizes the curvature. He compares it to a sort of rubber band that you might loop around neighboring fingertips, controlling the distance between them. If that control is lost in the juncture between cristae, the structure loses its shape and the folds in the membrane cannot hold. The biology of mitochondria has been difficult to study because scientists have lacked tools to manipulate the genes of the organelle. The breakthrough from Daumke's group came through rebuilding the parts of the MICOS complex in the test tube and studying the proteins' interactions with membranes. Their work provides the first definition of the roles of Mic60 and Mic19 in mitochondrial architecture, connecting the proteins' structures to their activity. In doing so, it explains how specific mutations in the molecules can disrupt the form of an ancient organelle that wandered into eukaryotic cells long ago, then became essential to their survival.